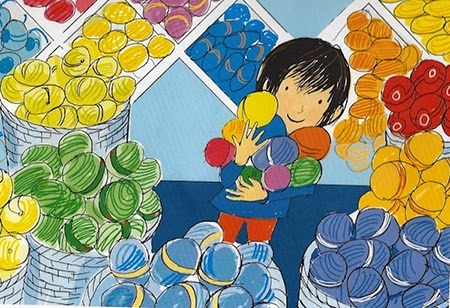 Made By Raffi is a gorgeous book, both in message and illustration! Raffi is a young boy who knows what he likes: colors, peace and quiet, and knitting. But all of these traits make him different from the rough and tumble boys in his class. Raffi is teased by his classmates, which leads him to ask his parents if it's ok to be different. Will Raffi stay strong in who he is, or will he give in to peer pressure? From the inviting cover and colorful endpapers to the simple yet powerful message in the text, this book is a joy for readers of all ages. It was just published in 2014, and is already out in multiple languages! It’s such a great message to spread - I love that my stepson and son will be able to grow up with this book. I had a chance to interview the author, Craig Pomranz, who is an award-winning actor and singer. HowIFeelAboutBooks: The book is dedicated to "the real Raffi" - how did you get to know him, and why did he inspire you to write? Craig Pomranz: Raffi is my godson. The book is based on an actual incident. He was having trouble getting to sleep one night, he asked a question and coined the word TomGirl -- that immediately hit me as a story to tell. HIFAB: You've been an actor and a singer - what made you decide to write a book? CP: I have always dabbled in writing. I consider myself an idea person. I'm always taking notes and writing dialogue, working on scripts and film treatments. When the real Raffi asked the question and used the word TomGirl, in the context of the recent attention to bullying and teasing I put it down and thought the story could be important and help kids and parents. HIFAB: Did the story come easily? CP: It did come easily, although the first draft was a longer version for older kids. It was surprisingly easy to boil it down and simplify it without losing any of the message. HIFAB: Was the publication process easier since you're already well-known? CP: I am certainly not well-known in the publishing world. I am very lucky. At a dinner party at a friend's place in London my book came up in the conversation. One of the other guests was in the publishing industry. My dinner companion asked me to send it and, amazingly, the next week they offered me a contract. Frances Lincoln was terrific during the editing process, and the book is currently published in eight languages so far! HIFAB: Why do you think your book has been translated into so many languages? What accounts for its success? CP: It is overwhelming for me to think about it. I hoped to help kids, parents, caretakers and even educators talk about respecting differences -- to discover that the message crosses cultures and to hear from people all over the world who want to tell their experience is so rewarding. I have concluded that all of us encounter difficulties growing up, feeling misunderstood, different from everybody else. Basically we are all human beings with the same growing pains who can identify with a little boy wondering why he is different. Maybe all of us seek to be like Raffi's calm, accepting family. HIFAB: How do you feel knowing so many people - children and adults alike - are relating to your book? CP: Reaching a wide range of people and having any kind of influence is the most rewarding experience of my life. It also gives me great hope for better understanding in the world. I am fortunate indeed. HIFAB: Are you going to write more books? For children? Adults? CP: I am working on several more children's books. They are also based on true incidents and have powerful messages of acceptance. I am also working on a book of interviews with celebrities and movie stars that I am very excited about. Visit Craig Pomranz on his website and as @MadeByRaffi on Twitter. 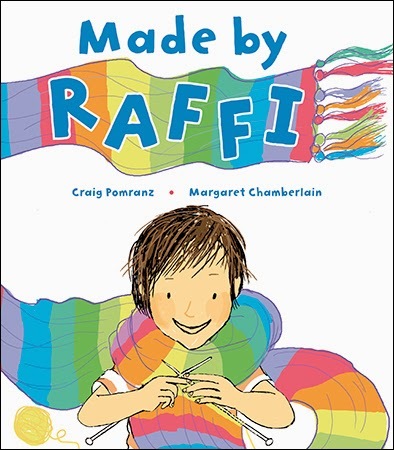 Grab your own copy of Made By Raffi on Amazon!